What Would Mike Do? 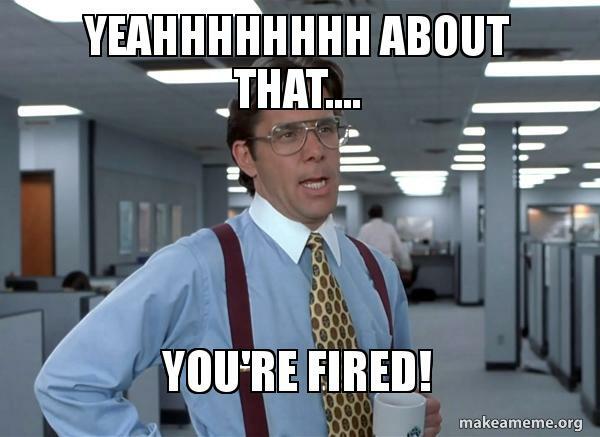 : The hotel blog: What do you find is the hardest thing about having to fire someone? It takes some emotional intelligence. You need to be hard enough to get it done, but you don’t want to be so hard that you leave lingering hard feelings, have them feeling robbed of their livelihood, or provoke a pushback or thoughts of retaliation. Move along already, get out of here, go on with your life, every new beginning comes from some other beginning’s end; this could be the best thing that ever happened to you, a new opportunity opening up . . .
On the part of the departing employee, there’s always an alternative view of his or her own performance, of the events that lead up to the termination, of the quality and quantity of work done by the employee and the usefulness of it to the organization, and/or of the employee’s behavior and the justifications for it. Indeed, that alternative view is so real to that employee, and the employee is generally so attached to that alternative view, that he or she stuck to it even when it was becoming more and more real (if not apparent to the employee) that his or her alternative view was not going to prevail and would cost him his or her job if he or she wasn’t willing to give it up. So, that’s how set in cement that alternate reality is, and how likely you are to win an argument against it. And there are always secondary consequences to the termination that cause inconvenience, hardship and even suffering for the employee. She can no longer pay her bills, the lights and phones get cut off. He can’t pay his child support and gets tossed into jail. She has difficulty finding another job because even if we don’t give her a bad reference, the termination itself is a sign of a problem to any future employer. The family ends up on food stamps. Put those two things together — the employee's alternative view of his or her performance, and the secondary consequences that will affect the employee as the result of the termination — and naturally, nobody who gets fired is going to feel that the decision to terminate them was right, just or reasonable. Even an employee who is aware and willing to admit that he made one or more mistakes is going to feel that his errors don’t justify what the company is doing to him in response. So, there’s always the potential for pushback by the now ‘disgruntled former employee’. And of course, since they make it to be ‘wrong’, and since the purpose of law is to define, uphold and enforce our notions of ‘right’ and ‘wrong’, they’re going to look for something illegal about it; both because they feel wronged, and because the secondary consequences are expected to put them in dire need of whatever relief the law can provide. Imagine the fight you’d be inclined to put up if one day, you came in to work and discovered that they were letting you go, everything about the way you did your job was wrong (even though you had no idea other than what someone who you didn’t believe or know to take seriously maybe told you), everything about you and your personality and behavior was completely inappropriate to the workplace (you never got that); and that you were being fired and thrown out in the street that day, you were facing immediate loss of income for which you weren’t prepared, all of the conceivable consequences for that loss of income, difficulty finding another job, and denial of unemployment benefits. You’d want to confront the person responsible, you’d argue (and if your personality or maturity level was such that your notion of arguing involved making a scene, so be it), you’d look for ways to push back and try to keep it from happening, you’d feel you were wronged and entitled to retribution and compensation for it, you’d check with a lawyer; and you’d give serious thought to any other means of defense, retaliation and pursuit of remedy that those circumstances would justify in your occurring world. Whatever your reason or cause to fire someone, that reason or cause has to be big enough, and the legality of your decision to fire that person has to be watertight enough, to withstand that big and bad a fight. The only way you’re not going to have that big a fight on your hands is if the departing employee gets it that your grounds are big enough, and the legality of your decision is watertight enough, that it’s no use and she doesn't have a leg to stand on — and because of the secondary consequences she is facing, she may still be in a position where she has nothing to lose by trying. And so yes, I tell my managers, run it by me before you fire anyone. As a salaried manager, I don’t mind being accountable and behaving legally, but I never wanted my staffing authority restricted in any way, or my hiring or termination decisions questioned. But times are changing and while I try to support them and uphold their authority to the extent that I can, I can’t give managers working for me quite that much latitude. Nowadays, there’s too much trouble they can get me into. Indeed, ‘fire-crazy’ middle managers can cause you more problems than the people they fire, even when you include the grief and aggravation you get from the ones who could have maybe been salvaged and who didn’t really need to be fired. ‘Cat’s paw’ liability, established by some courts over the last ten years, can make your company liable for any wrongful discharge that one of your managers does, even if he or she clearly acted outside your established company policy in doing so, and even if it was done in a way that you didn’t know what he or she was doing, and that you would have never done or supported. Things to screen for when you advance people into management or supervisory accountabilities . . .
People who rely too much on threats of discipline or termination to motivate performance, or to deter substandard performance or bad acts. Captain Queeg was never the Navy’s best skipper, even when he wasn't suffering an acute psychotic episode in the middle of a typhoon. People who see their ability or 'authority' to impose discipline or termination as an expression of, or access to, their own personal power or status. Any wannabe 'authority pig', anyone who regards authority over others, or the ability to act out against others under color of company authority, as a workplace perk to which he or she is or should be entitled, or has 'earned'. People whose efforts to work with, give additional coaching or training to, straighten out, rehabilitate, salvage, or redeem errant employees are lacking — or completely non-existent. People who act rashly in making decisions around discipline or termination. As the book version of The Godfather noted (of a man who a few days later would awaken to find the severed head of a horse in his bed, in that memorable scene in the movie version), the sort of “megalomaniac who loved to wield power wildly, without regard to the fact that by so doing, legions of enemies sprang up out of the ground”. Even worse, people who delight in firing people or — even worse than that — people who delight in some or all of the secondary consequences of a termination (e.g., “You’ll never work in this business again, not with the reference that you’ll leave here with!”, “You can forget about collecting unemployment!” . . .) Either they’re blind to those secondary consequences, which makes them too ignorant or lacking in empathy to have people working under them; or they’re actually present to those secondary consequences and delight in the prospect of inflicting them, which makes them probably psychopathic and more likely just plain evil in my book. They’d never even begin as managers in my company if I could spot them consistently, but the best I can do is screen them out as best as I can, and get rid of any I missed as expeditiously as possible once I spot one — I can’t get them all off the planet. There’s never a need, or a good reason, for that way of being. We remove people as necessary so that we don’t have to worry about what bad thing they’re going to do next, or so that we can have room (in both the organization and its budget) to hire someone that we can get a better performance out of; but firing people is not something we do to throw paybacks or inflict suffering as punishment for some wrong, whatever the wrong. What’s the old Nietzsche quote, “Mistrust any in whom the desire to punish is great”? We keep confidential, internal records and hold our managers accountable for their performance in the areas of recruiting, hiring, supervision, employee performance, discipline and termination. If someone you hired for us works well and earns an advancement, a cookie award, or candidation as management, you get brownie points in your file for finding and hiring and training and coaching and bringing along this person, even if they’re no longer working under you at the time of the achievement. If they screw up and have to be written up, referred for individual coaching, or terminated, you likewise get black marks in your file for sticking us with these skids that you hired and trained — hey, where do you keep finding these people? We’re not necessarily out to pressure or penalize managers (unless one really sticks out as needing extra help or coaching in that area, or some restrictions on their authority in that area, or removal altogether). What we’re really out for is to see who scores the most brownie points and/or the fewest black marks, find out what they’re doing differently, and see if we can scale that up; if what they’re doing can work for the others, or can be written into our personnel policies or manager training. Things that apply in all firing situations. You need to be cool and dispassionate about it. It may be possible that the employee did something so bad that you want to strangle him to death on the spot. It may be true that whatever precipitated the firing proves for the umpteenth time that the employee is too stupid to have a job. But doing it in anger or disgust — or even making the decision to do it while you're in a state of anger or disgust — significantly increases the odds that you’re going to make one of those thousand bad mistakes as you’re doing it, probably more than one, perhaps even one of the more grievous ones. When you give him the bad news, you want to be there mentally prepared to stick to business — watch your way of being, don’t get emotional, don’t get personal (no matter how you might ‘enjoy’ it if the employee really was that bad or did something that bad), just stick to business. If the termination is in response to ongoing performance problems, then you’ve already had time to think it over and plan ahead for it, but one thing I picked up from one of Doubletree’s predecessor companies is, if a termination is being considered in response to a specific act, write up the employee and place him or her in a “suspension pending determination” status for several days. (Pickett Suites called it “suspension pending investigation”, but there’s usually not that much to investigate, and deliberation is a better use of the time.) Some of my more cynical, colorful people find “suspension pending termination” to be a natural play on words, but even if that’s all it is, even if the final outcome is obvious and it can’t be any other way, at least give yourself a few days to calm down and approach it rationally. In a few cases, you may even decide you don’t really need to go quite that far with it. And even where it’s obvious that you do, you can plan ahead and approach it tactfully. You need to make up your mind what you’re going to do, and stick to it. Given the disproportionate stakes involved for the employee as we’ve noted, even policies you have in place to give an employee some due process and protect them from arbitrary behavior by middle management is going to be something a departing employee will want to game against you if he can think of a way to do so. You know that at the very least, they’re going to try and argue their way out of it, and you know to consider in advance that there might be a scene. You need to go in committed that now that the decision is made, it’s not up for debate, and hold the line. Give in one time, and you can plan on the employee — and any other employees with whom she shares her experience with it — put up at least that much of a fight every time you have to remove someone. Regarding the foregoing . . . it’s good and kind of you that you’re mindful of the secondary consequences of a termination to an employee, and indeed we demand and expect no less from you, and would be very disappointed in you if you didn’t take that into account. But that can’t be the controlling factor. The needs of the company, and the hotel, must come first. My heart goes out to anyone who loses their job, loses their income, can’t pay their bills, and gets their car repossessed, too, even if they messed up, or kept messing up, and brought it down on their own head. But we use a progressive discipline policy, with enough restraints and brakes and fail-safes and modifications added to it to insure that we’re not stupid with it, and that we’re going the extra inch to work with these people, and giving them extra training and help and coaching in an effort to bring them around; so that we should be pretty confident that anyone who still manages to not be able to do the job, in spite of all that, did indeed bring it down on their own head, and that there’s nothing else we could have done that would have done any good. Anyone we do ultimately fire probably did deserve it. On the flipside of that . . . your awareness that there are a thousand ways to make a mistake in a termination and incur legal trouble, and your commitment to avoid that if at all possible, if it’s known to your people, is something else that a departing employee will probably (again, given the stakes for himself as he’s facing the secondary consequences) try and play against you. Don’t be intimidated by it. This is definitely something you don’t want to give in to. If you’re not sure of your cause, and you’re not sure you’re doing it legally, then you have no business having this conversation with him. If you are sure of your cause and your legal ground, get it done, do it powerfully. This is one threat you don’t want to back down to: if you do, once word gets around, it will be played against you every time, any time you need to terminate anyone, for whatever cause. One theatre chain for which I was a manager for the better part of twenty years was so well-known, even to its minimum-wage hourly employees, to be so paranoid about discrimination — and later, sexual harassment — suits that more than once, it was sued by a terminated manager claiming discrimination in that he was fired to appease ot accommodate an aggrieved employee who was part of a protected class, and that the termination was merely an attempt to preempt possible litigation by that employee of a discrimination or harassment claim lacking in merit. They were very bad about overreaction to any allegation of discrimination or sexual harassment, and I myself saw them a few times flee a wolf only to run into a bear. Once you’ve reached the conclusion that with any particular employee — even one that you've never considered firing, who hasn't yet done that one thing — that you know how this one’s going to end, that sooner or later that employee is going to have to be removed no matter what happens in the meantime; then 'sooner or later' has arrived, and the time for trying to rehabilitate or salvage the employee or bring him or her around has passed — do it already. Don’t let things accumulate, build up, or fester. Don’t allow new issues or occurrences to accumulate and further complicate things when the time does come. Some years back, a Landmark seminar leader who was an attorney specializing in employment law in his day to day working life shared with us that, in every single piece of employment-related litigation that crossed his desk, what turned out to be a part of it every single time, once all the costly discovery and depositions were done was, invariably, that employment situation had broken down irretrievably and stopped working for both the employee and employer long ago, usually months, sometimes years. Whatever in the end happened to bring about the ultimate firing, or the ultimate tantrum where the employee resigned and left the establishment feeling that he’d been run off by the employer, was always merely a precipitator, a catalyst, the proverbial final straw. And looking back in my own life, many times when I’ve had an employment situation go bad (both as an employee who’d eventually be fired or quit on not altogether the best of terms myself, or as a salaried manager dealing with such employees), it had worked that way — I had known for some months, even a year or two, that it was going to end and that it was probably going to end badly. What I didn’t know or couldn't deal with at the time was, once you come to that realization, it’s time for someone to go. So once you know that’s how it’s going to end, and there’s little to no realistic chance to turn it all around, it’s time to end it. It’s only going to get worse. If the employee’s response is an unemployment hearing, a lawsuit, or an administrative hearing; the less the employee’s tenure and accumulated baggage, the less there is to litigate. Unless you live in a jurisdiction where high unemployment insurance premiums are a problem, if they can collect, let them collect, unless they did something so beyond the pale of acceptable conduct — dishonesty, workplace violence, sexual harassment or assault, drinking or using drugs on the job — that you’re rewarding very bad behavior in a way that’s going to have your own sense of morality called into question, if you let it slide. (In Pennsylvania, even the people at the job service office make no secret of it that you have to have done something pretty bad to be denied unemployment and even then, you've still got a shot. Connecticut is somewhere in the middle. We haven’t taken a hit in West Virginia yet. ‘Business-friendly’ North Carolina will put a hold on any unemployment claim if the employer sends back the form contesting it, then weeks later have a ‘fair hearing’ that doesn’t pretend to be fair, and in the unlikely event you win, your first unemployment check won’t arrive until a week and a half after that . . . The last time we opposed an unemployment claim was for a pair of housekeepers who, for some weeks prior to their departure, made no secret of it that they were hoping to deliberately provoke their own firing, in order to collect; something we couldn’t afford to let other employees who knew of their scheme see them pull off successfully and get away with.) It’s in keeping with our desire that the employee move on, have something to move on to, quietly float away; and that we work toward a clean break and no hard feelings. So unless they did something so outrageously wrong, low-down and common that you're a chump to let them have it, don't fight them over the unemployment. Make sure it’s legal, from all possible angles. No one likes a rabble-rouser who’s always stirring up something among other employees in the workplace, looking for ways to challenge management, and keeping the employee rumor mill fueled and primed; but if you fire one and the NLRB decides that it could have been “protected concerted activity” under the National Labor Relations Act, you’ve just bought yourself a costly administrative proceeding that can in the end cost you a very disruptive reinstatement with back pay, or a pricy settlement for ‘front pay’ in lieu of reinstatement; is easier and faster for an aggrieved employee to win than, in North Carolina, a claim for unemployment insurance, and pays out nearly as much (of your) money to an employee as the average employment-related lawsuit. It’s a lot more difficult than is popularly known to win a discrimination claim — “termination for legitimate non-discriminatory reason, the presence of discrimination notwithstanding”, is one of several possible defenses — but they are costly to defend if someone wants to play the race, national origin, or gender card. The inevitable inclusion of gay people (thanks to Obergefell v. Hodges), and transgenders (thanks to North Carolina’s one-time ‘bathroom bill’ — the litigation challenging it, which is on four corners with Romer v. Evans and now in the Federal appellate system on its way to the Supreme Court, didn’t go away once the bill was repealed), as protected minority groups under federal law, will add that much more diversity (bad pun, I know) to opportunities and options for aggrieved employees who can claim such status. What to do about future reference checks by other employers is a question with no easy answers. There is always the problem that the departing employee’s subsequent prospective employers, particularly the next one, is going to see any termination as a problem unless there’s an explanation that he’s comfortable with; and if you follow the common practice of only confirming dates and no more, they’re going to think that there’s something to know about the abrupt termination of employment that you’re not telling them. There are some possibilities where we can incur liability from a subsequent employer of that employee if we don’t tell him something, that he could conceivably make a case that we had some duty to disclose to him. While a standard or ideal might be difficult to settle upon, the principles and values by which we are generally guided are to act in alignment with our desire to make the break clean, have the employee move on, and have something to move on to, and quietly float away. This is one of those I’m going to have to keep coming back to.